Dogwood trees are beautiful, iconic landscaping trees that come from the forest understory. Although they’re great for adding lots of curb appeal, they’ve got a few serious problems that can spoil the idyllic feel of your yard. It’s never good news when a tree gets sick, especially when it’s your stately dogwood tree. Dogwood tree blight, for example, is a fungal infection of dogwood trees that can turn these valuable visual assets into serious detriments. Read on to find out about dogwood tree blight and what you can do to help your plant through this rough time. Dogwood blight, also known as dogwood anthracnose for the fungal pathogen that causes the disease, is a fairly new problem. It is believed to have started in the northeastern United States about 25 years ago, but has been spreading southward ever since. The early symptoms are similar to leaf spot diseases, with purple-bordered soft, wet spots appearing on leaves, especially around the margins. 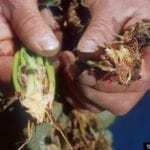 Once the disease spreads to leaf petioles and twigs, however, it becomes more obvious. Leaves attached to these infected areas will shrivel and turn black. In very advanced disease, lower branches may die, cankers may form on the limbs and trunk sprouts will increase in number. Dogwood blight control is difficult, but if you catch it early, you may be able to save the tree by cutting out all diseased tissues. That means all leaves, all twigs and all branches showing signs of infection must be removed and destroyed promptly. Small trees may be saved with a fungicide spray applied every 10 to 14 days as long as cool, moist weather persists. Prevention of dogwood blight is the best tool you’ve got to keep your landscaping trees healthy. 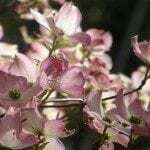 Keeping your dogwood properly watered and fertilized is the first line of defense, two to four inches of mulch spread over the root zone will help maintain soil moisture. Removing spent leaves, pruning low branches, opening up a dense canopy and trimming water sprouts in the fall will create intolerable conditions for the fungus. If you’ve lost a tree to dogwood blight, consider replacing it with Oriental dogwood (Cornus kousa). It has a high tolerance to anthracnose. White dogwoods seem to be less susceptible to the infection than their pink counterparts; there are also new cultivars of the Appalachian dogwood series that are bred to be anthracnose resistant. Whatever you do, don’t transplant a wild dogwood into the landscape – this is how many infections started.